Description: Shrub to 2 m high with hard, rough bark. Leaves alternate, ± terete, usually 5–12 mm long, c. 0.5 mm wide, apex apiculate, glabrous; petiole c. 0.5 mm long. Inflorescences many-flowered spikes 1–4 cm long; rachis glabrous. Flowers solitary within each bract, pink. Petals ovate, c. 2 mm long. Stamens 15–30 per bundle; claw 3–6 mm long. Fruit shortly cylindrical, 4 mm diam., orifice 2 mm diam. ; sepals persistent as undulations on the rim. Distribution and occurrence: Grows in open forest, in areas subject to flooding; on the coast in the Sydney region, and in inland districts north from Griffith. 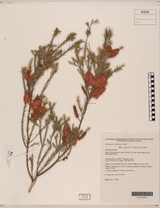 Some botanists consider that M. diosmatifolia Dum. Cours is the correct name for this taxon.